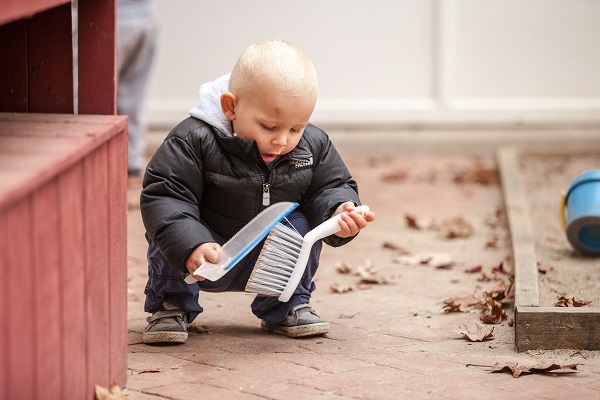 The Toddler-aged child needs to have the opportunity to explore movement, acquire language and develop independence in a specially prepared environment. In Montessori, there is a strong connection between intellectual activity and physical movement. There is an emphasis on creating opportunities to pursue independent, precise motions. These form the basis for later intellectual endeavors. Developing spoken language and learning communication skills are both critical in the early years of a child’s life. Thus, vocabulary is consistently presented to the children and the adults encourage conversation, model appropriate syntax, and offer rich and precise language. Stories, songs, and poetry all support the language work in the classroom. The young child is very sensitive to his or her surroundings, absorbing and integrating elements. Therefore, the classroom and the outdoors are established and maintained with an emphasis on beauty, order and simplicity. The child's sense of self and understanding that he or she is part of a caring community are fostered. When children begin school, they are gently introduced to the rules of community, respect for others, respect for the possessions and work of others, sharing, taking turns, etc. The Toddler Program, with an AMI certified Montessori teacher and an assistant, serves a community of 10 to 12 children between the ages of 14 months and 2 ½ years. The children attend school five days a week from 8:45 a.m. until noon. We also offer an extended-day program until 3:15 p.m.
"I have twenty three grandchildren and so I have visited a lot of schools here and abroad and all are quite nice but this school is my absolute favorite. There are some obvious reasons (why Montessori is so special) - wonderfully welcoming, a joyous place, a pleasure to be here. But more deeply, Montessori embodies for me the three cardinal virtue: faith, hope and charity. Faith is exemplified by the devoted staff that sees in each child an independent and responsible person capable of achievement using his or her own innate gifts. Hope abounds in this place. As you pass by all the fantastic assemblages int he corridors, inspiring projects created by the students themselves, you realize there is no limit to what they can do. And then there are the wonderful plays, concerts...you name it!